EB-DVG3M01 Dodge Viper SRT/10 (2003-2006) Convertible Metal Die Cast. Highly Detailed realistic and detailed! 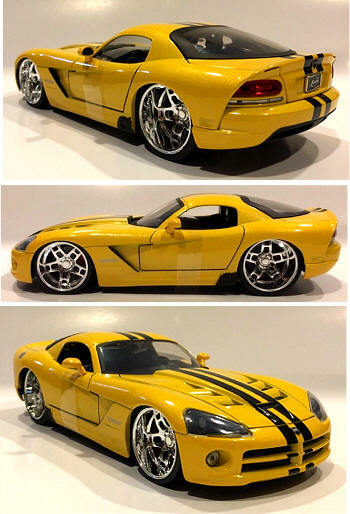 Collectors model of the current SRT/10 Viper. Box may not be in perfect condition. EB-DVG3MBLK BLACK Dodge Viper SRT/10 (2003-2006) Convertible Metal Die Cast. 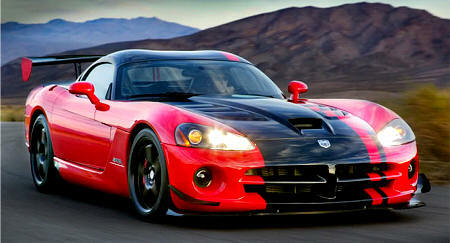 You'll be thrilled with this life like model of the third generation Viper! Highly Detailed realistic and detailed! 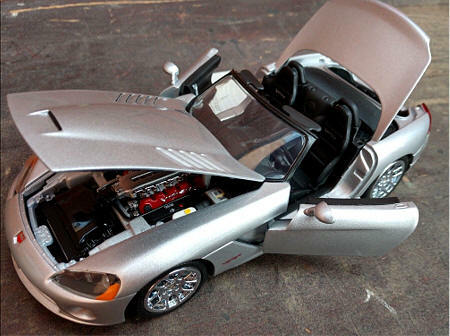 Collectors model of the current SRT/10 Viper. EB-DVG32F2F-YEL YELLOW Dodge Viper SRT/10 Convertible Metal Die Cast. Large 1:18 Scale. "2 Fast 2 Furious Movie"
No longer made - Very Rare. Right out of the movies this high quality diecast replica. Approximately 10 inches long by 4 inches wide. 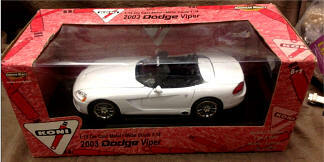 EB-V3-WHITE18 Dodge Viper SRT/10 WHITE Convertible Metal Die Cast. Large 1:18 Scale. 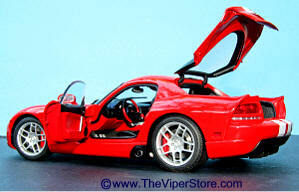 EB-V3-CPE2006 Dodge Viper RED SRT/10 (2006) Coupe Auto Art Diecast Scale Model. Medium 1:18 Large scale. Limited Edition of 6000 pieces worldwide! 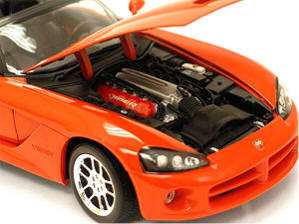 This is the highest quality scale replica made by Auto Art of the the real Dodge Viper SRT-10 2006 Coupe. car is a limited production model which is brought to you from the fine makers of Autoart. 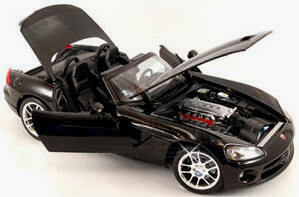 Autoart is the leader in ready-made diecast model cars. Highly collectible Autoart models are setting a new standard in 1:18 scale diecast for detail and accuracy. 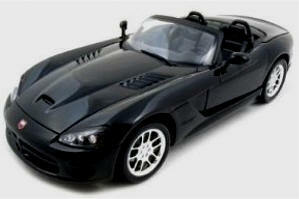 Nicely crafted in 1:18 scale by Autoart this is the Dodge Viper SRT-10 Coupe in black. Highly detailed inside and out the collector will surely appreciate the intricate details of this impressive replica. 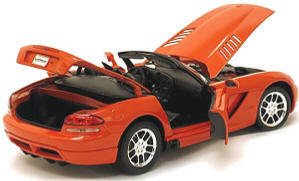 This model has opening doors and hood as well as functional steering. Made of diecast metal with some resin details. 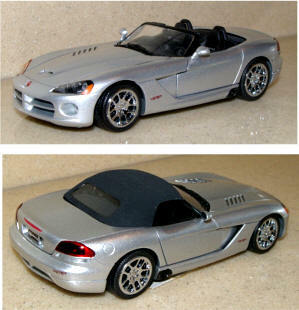 EBV3FM-SILVER124 Franklin Mint Dodge Viper SILVER SRT/10 (2003-2006) Convertible Diecast Scale Model. 1 of only 2500 produced. Retired and NO longer available in stores. 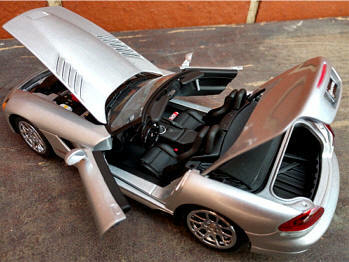 This is the highest quality scale replica made of the the real Dodge Viper SRT-10 2003-2006 Convertible. Franklin Mint is the most respected manufacturer of scale metal models. This collectors piece is only for the serious scale model collector. Extremely well made with the finest details of the interior, dash, seats, and engine. Opening doors, trunk and hood. Real rubber wheels. This is an exact replica of with a flawless attention to detail. 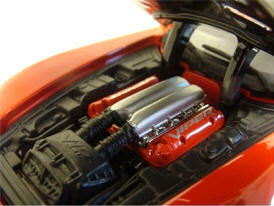 The highly detailed engine, trunk compartment, and all the interior spaces are of the most exquisite detail. This gem is a limited production model brand new sealed in original box which includes all documents of authenticity. Also included are special tool for opening trunk and hood, a stand, and a set of white gloves for handling. Nearly 8 inches long. 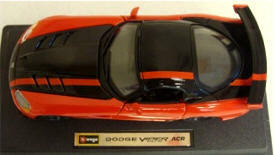 Dodge Viper SRT 10 ACR Red/Black 1/24 Diecast Bburago Model Car. Has steerable wheels. Brand new box. Rubber tires. Opening doors, hood. Dimensions approximately L-7, W-3, H-2.25 inches. Extremely high quality, highly detailed inside and out - this beautiful 2008 Viper SRT-10 Coupe is the only model like it on the market. Hood opens to expose the detailed 600 HP engine, doors open to view detailed interior, Trunk opens to see an accurate trunk compartment. Includes upgrade Viper chrome wheels. Nearly 8 inches long.